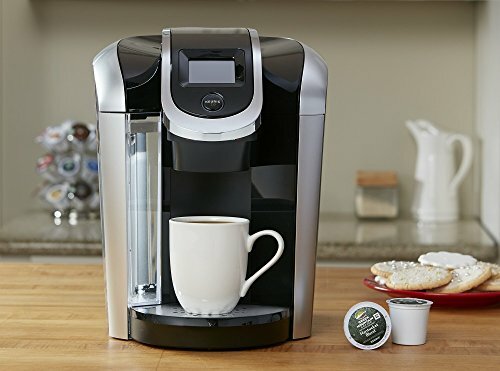 The Keurig 2.0 system offers users the ability to easily brew multiple size beverages, from a 4oz K-Cup all the way up to a 30oz K-Carafe. To ensure an optimal brew each time, the 2.0 system introduces a K-Cup ‘reader’ that detects which pod has been inserted and adjusts the brewing cycle and temperature accordingly. There are several Keurig 2.0 model brewers available. These all have essentially the same functionality, but also a few important differences. To help you choose the best model for your needs, take a look at our comparison of two popular brewers in the range, the K450 and K475. The K450is fully functional slimline Keurig 2.0 brewer that offers a certain level of flexibility and control over your beverage. 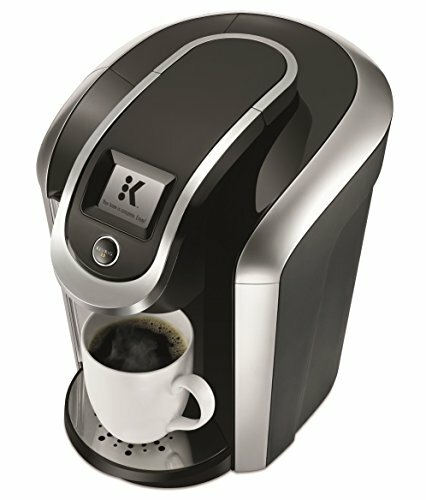 If you’re already a Keurig user, the operation of the K450 will be familiar to you. Ensure the 70oz water reservoir is topped up, lift the handle at the front of the brewer, insert the pod of your choice, and lower the handle. The K450 lets you choose your desired brewing options using the 2-inch color touchscreen (with English, Spanish or French language options). You can adjust the strength of the brew (the stronger the coffee, the less water is used to brew the pod). Sizing: With the K450, you get to choose between 9 different serving sizes, from 4oz to 30oz, for single or multiple cups. The 4, 6, 8 and 10oz sizes are for single K-Cups, while the 12, 14 and 16oz options are for the larger Vue packs. The 22oz to 30oz options are for use with the 4-cup K-Carafe. With the K450, the compatible carafe itself is supplied as standard. Brewing with ground coffee: You may be aware that Keurig 2.0 system introduced a new range of compatible pods. This is worth bearing in mind before purchasing – especially if you’re upgrading from an old-style Keurig and have a stack of old-style pods to use up. When the 2.0 system was launched, the brewers would not accept the My K-Cup reusable filter, but Keurig has now rectified this omission, so you can also brew with your favorite ground coffee. 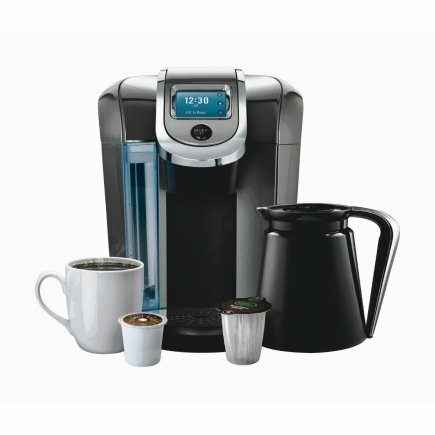 Comes with: The K450 is sold new with 6 K-Cup pods and 4 K-Carafe pods to get you started. You also get an optional water filter, water filter handle and cartridge. Brew time: Brew time on the K450 is standard for a Keurig 2.0 brewer, taking around 1 minute to brew a single cup and all of 3 minutes for a full 4-cup carafe. If you want plain hot water, run a brew cycle without the pod. Programming: One of the advantages of the K450 over some other 2.0 brewers is that (for carafes only), you can program the brewer to start at a specific time – perfect for those busy mornings or for those who like to wake to the smell of freshly brewed coffee. There is also an automatic switch-off facility that promotes energy saving and you can set the brewer to accommodate higher altitudes. Additional features on the K450 include the 5.5-inch cup clearance, which can be increased further to 7 inches if you remove the drip tray. Maintenance: Maintenance on the K450 is standard. The outside of the unit should be wiped down with a soft cloth. The removable drip tray, water tank, and carafe should be washed by hand in warm soapy water. A periodical descaling of the brewer is required. Frequency depends on water hardness and how often you brew. Overall, the K450 offers good functionality at a reasonable price. The brewer is a step up from some of the early 2.0 models, benefiting from an enhanced touch screen, programmability, and control. The K475 is an updated version of the K450 and in fact replaces this model in the manufacturer’s range. As such, you’ll find many of the same features and functionality, along with a few improvements aimed at making something pretty good even better. From a purely aesthetic point-of-view, the K475 looks the same and it shares the same basics in common with its older predecessor, including water tank size and dimensions. Options: Options are selected using the same 2.4-inch color touch screen, which, as with the K450, can be set to the English, Spanish, or French language. There is a separate setting for specialty beverages and the K475 features one additional brew size (the 12oz K-Cup). You can also use the reusable pod with the K475, allowing you the flexibility and environmentally-friendly option of brewing with a ground coffee of your choice. As you might expect, the maintenance duties are the same too. Overall, there not much that’s different about the K475 as compared to the K450. The main additions are the temperature control setting and an extra brew size, the 12oz K-Cup pod. Other than that, the K475 is really just a slightly updated and streamlined version of its predecessor. Check out the latest prices and discounts here! 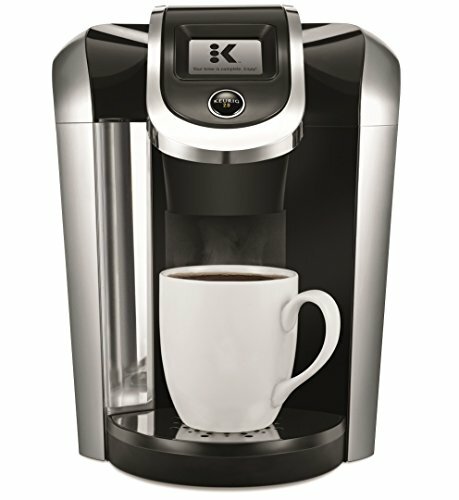 The K450 is best for: Anyone looking to experience the Keurig 2.0 system at a reasonable price. The K475 is best for: Anyone looking for the most bang for their buck, as you get slightly more with the K475 for around the same price point. So what’s the final verdict? By a slim margin, the winner of this particular Keurig bout has to be the K475. It replaced the K450 model in the manufacturer’s range, retaining all of the older model’s features and adding a bit more control and functionality.